For French livre (unit of currency), see French livre. For other uses, see Livre (disambiguation). 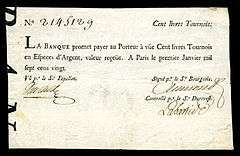 The first French paper money, issued between 1701 and 1720, was denominated in livres tournois (see "Standard Catalog of World Paper Money", Albert Pick). This was the last time the name was used officially, as later notes and coins were denominated simply in livres, the livre parisis having finally been abolished in 1667. With many forms of domestic and international money (with different weights, purities and quality) circulating throughout Europe in the late Middle Ages and the early modern period, the use of an accounting currency became a financial necessity. In the world of international banking of the 13th century, it was the florin and ducat that were often used. In France, the livre tournois and the currency system based on it became a standard monetary unit of accounting and continued to be used even when the "livre tournois" ceased to exist as an actual coin. For example, the Louisiana Purchase treaty of 1803 specified the relative ratios of the franc, dollar and livre tournois. The official use of the livre tournois accounting unit in all contracts in France was legislated in 1549, but it had been one of the standard units of accounting in France since the 13th century. In 1577 the livre tournois accounting unit was officially abolished and accountants switched to the écu, which was at that time the major French gold coin in actual circulation, but in 1602 the livre tournois accounting unit was brought back. (A monetary unit of accounting based on the livre parisis continued to be used for minor uses in and around Paris and was not officially abolished until 1667 by Louis XIV). Since coins in Europe in the Middle Ages and the Early modern period (the French écu, Louis, teston d'argent, denier, double, franc; the Spanish doubloon, pistole, real; the Italian florin, ducat or sequin; the German and Austrian thaler; the Dutch gulden, etc.) did not have any indication of their value, their official value was determined by royal edicts. In cases of financial need, French kings could use the official value for currency devaluation. This could be done in two ways: (1) the amount of precious metal in a newly minted French coin could be reduced while nevertheless maintaining the old value in livres tournois or (2) the official value of a domestic or foreign coin in circulation could be increased. By reversing these techniques, currencies could be reinforced. the worth of an écu d'or, a French gold coin, was changed from 60 sols to 57 sols in 1573.
to curb increasing use of the Spanish real, its official worth was decreased to 4 sols 2 deniers in the 1570s. Royal finance officers faced many difficulties. In addition to currency speculation, forgery and the intentional shaving of precious metal from coins (which was harshly punished), they had the difficult problem of setting values for gold, silver, copper and billon coins, responding to the often large influx of foreign coin and the appearance of inferior foreign coins of intentionally similar design. For more on these issues, see Monetary policy and Gresham's Law.